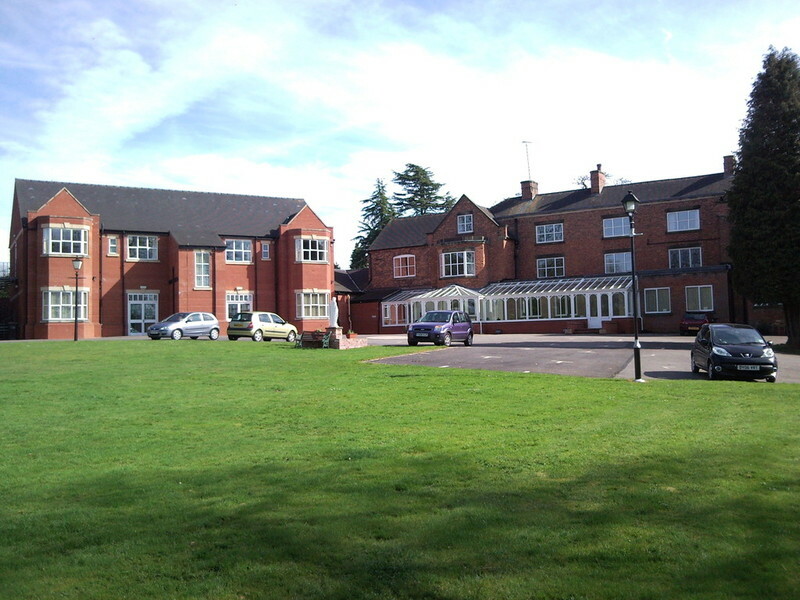 This past week I joined a number of our priests from the Diocese of Lancaster for our bi-annual retreat, which took place at the Oblate Fathers’ Centre, called Wistaston Hall, close to Crewe. 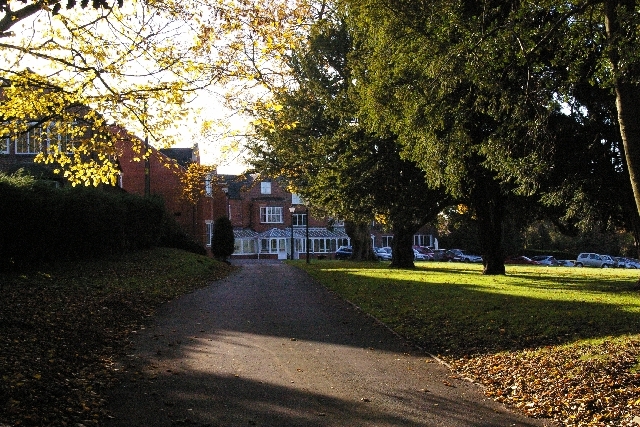 We were blessed with excellent sunny weather throughout our time there, and the limited but well-maintained grounds, with a nearby park, gave us ample scope to get out and about and take advantage of the pleasant climate. 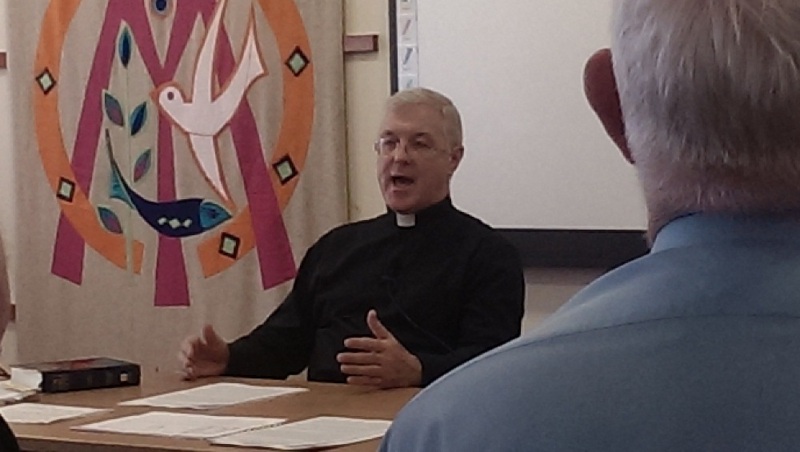 A priest from the Archdiocese of Liverpool led us in retreat and his conferences offered us much spiritual food for thought. As the word itself suggests, a retreat is a time of withdrawal and, much like a pilgrimage, provides the opportunity to stop and take stock of ourselves and the direction which our lives are taking. Given the widespread prevalence of the social media, and at times the seemingly never-ending stream of emails and text messages, a retreat affords us a break from such relentless engagement through its provision of space for silence and prayer. The fraternal presence of brother priests helps to create a unique atmosphere, and those moments of sharing and conversation, especially at table, were much appreciated. A retreat has its own rhythm, but at its centre stands the figure of Jesus Christ, and his promised abiding presence with his Church. The silent holy hour each evening before the Blessed Sacrament allowed us to sit with the Lord as his priests, with whom we have a unique link through our priestly ordination, and of course He with us. This very precious hour further nurtured our intimacy with the one who called us and has empowered us for priestly ministry. We can also rediscover in stillness and prayer the depths of our identity as priests of Jesus Christ. The celebration of Mass each day brought us together liturgically to hear afresh the word of God in the Scriptures and to recall the memorial of his passion through sharing in the sacred food of his holy Eucharist. 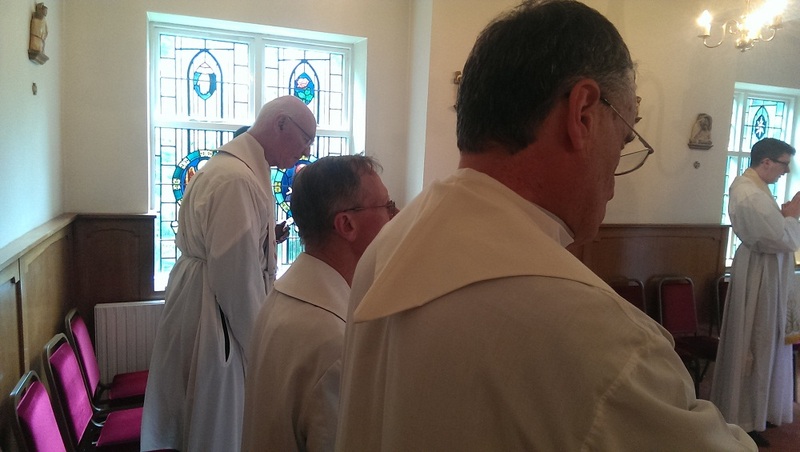 Nothing touches a priest more deeply than the celebration of Mass, and to do so with fellow priests on retreat is for me as bishop a very special and satisfying experience. Following on the Lukan Emmaus story (ch.24), we really did encounter the Lord in the Scriptures and in the breaking of bread. 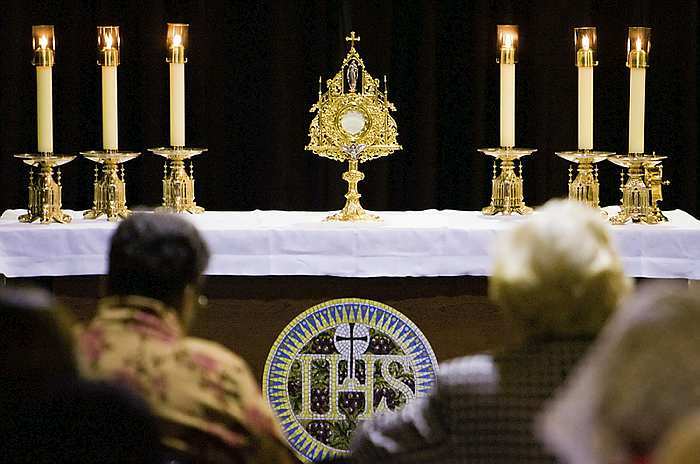 Our Eucharistic celebration in truth brought a completion and wholeness to each day of our retreat. The ultimate retreat-director is of course the Holy Spirit. As the days pass we realize that while books and other aides have their place, just to leave oneself open to the gentle impulse of the Spirit brings a profound sense of interior refreshment and peace. This is something we cannot give ourselves, and represents the gift of God which Jesus spoke about in his dialogue with the Samaritan woman. 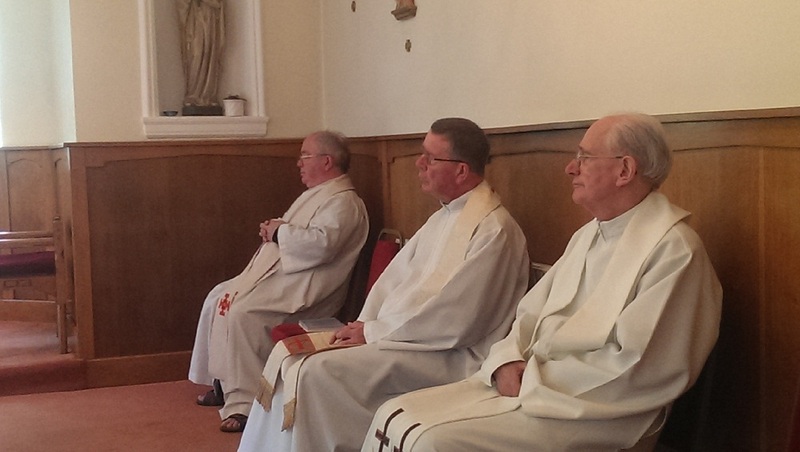 A final thought, and an edifying one, was the use made of the Sacrament of Reconciliation by the priests on retreat. Each priest on our retreat would, I am sure, willingly acknowledge the wonderful moment of grace and mercy experienced in the reception of this often under-used sacrament. 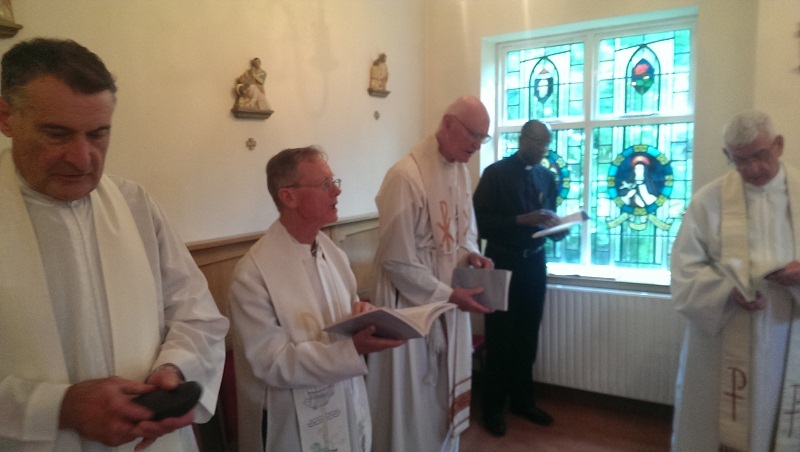 The few days together passed quickly, but we priests did depart from our retreat centre uplifted and glad to have given this time to the Lord. Until next week – May God bless you all. 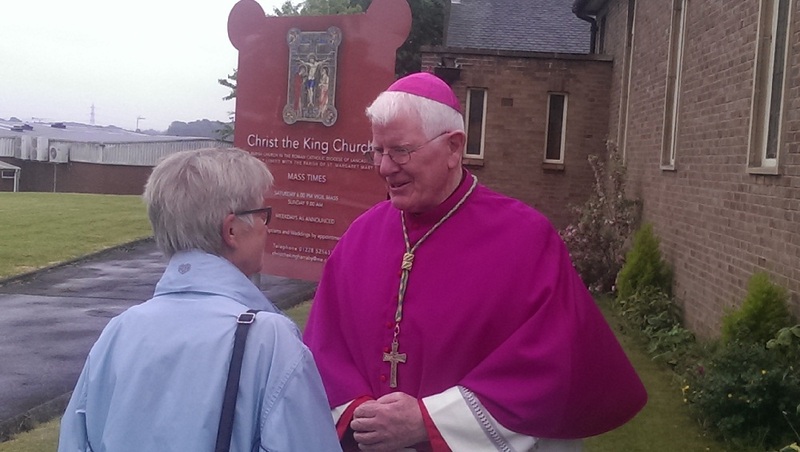 Thank you, again, for supporting the Bishop’s Blog – my weekly online reflection as Bishop of Lancaster! 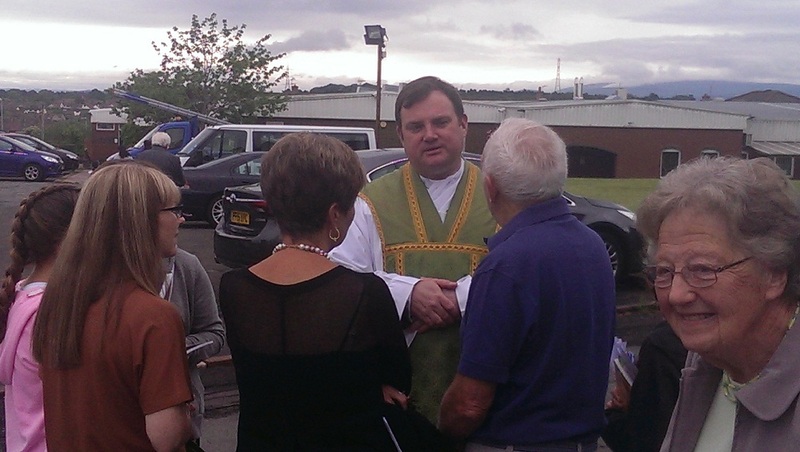 Parish Visitations form a routine part of a Bishop’s pastoral ministry, but for the parish priest and parishioners they are special occasions and more often than not eagerly anticipated. 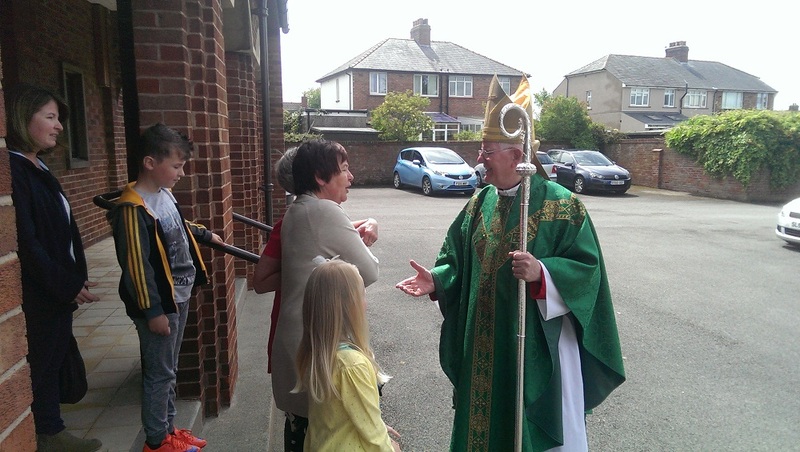 A Visitation then gives the whole parish a chance to attend Mass celebrated by the Bishop and meet with him afterwards, usually over refreshments, for a brief chat. What has surprised me is the number of people who remark that they have never previously met a bishop! 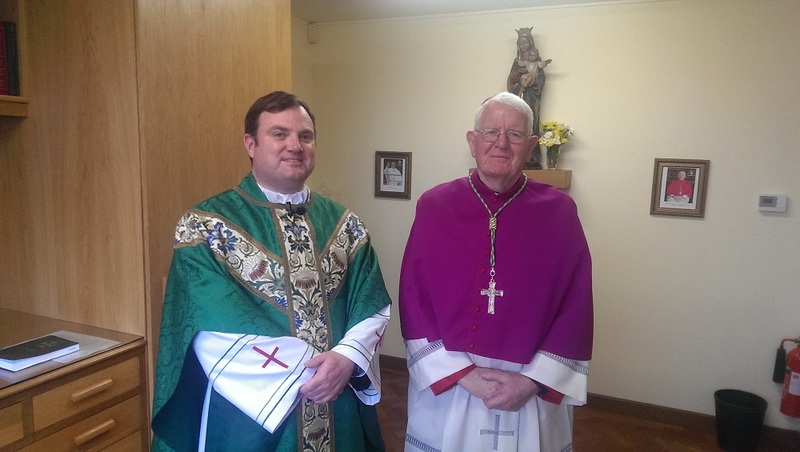 More formal meetings also occur within a Visitation, such as that with the parish council and with the parish priest himself, when issues of immediate or longer term importance can be raised. 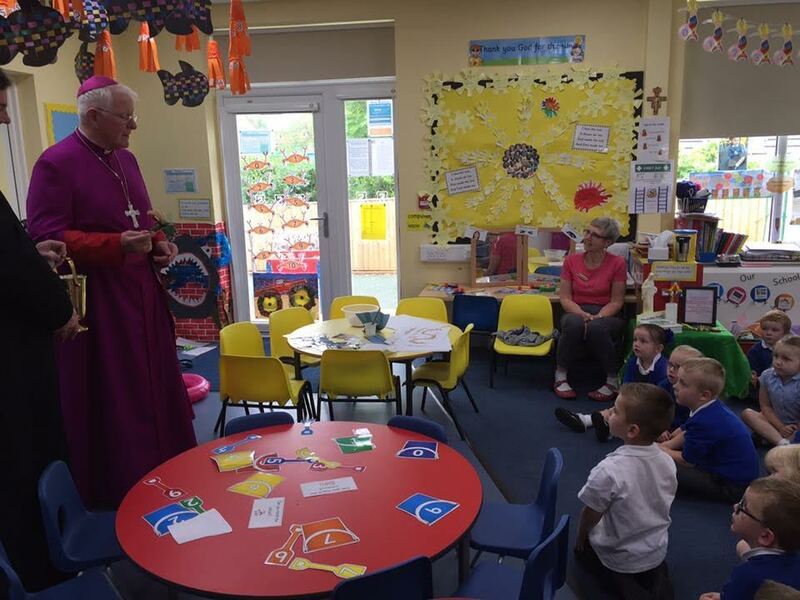 A visit to a parish school usually concludes the Visitation. This last weekend I made a parish Visitation to the Sacred Heart of Jesus Parish, Carlisle, which has two churches, St. Margaret Mary’s and Christ the King, in which all the above elements were included. 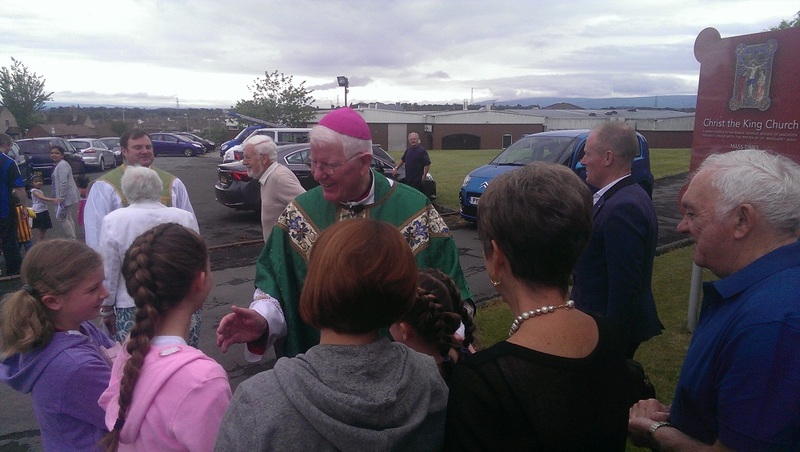 I celebrated Mass in both churches on the Sunday morning, mingled with the parishioners afterwards, and later in the morning joined many for a ‘shared lunch’. How getting together for something to eat, engaging in conversation, and catching up with friends, brings its own rewards, not to mention building up and giving cohesion to a parish community! As someone rightly observed, such shared moments are a real continuation of the Eucharist celebrated earlier in the church. 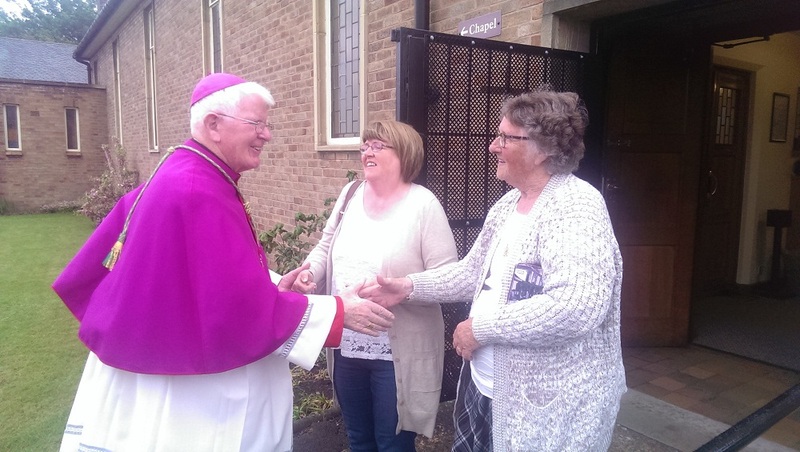 A regular but most important part of a Bishop’s Parish Visitation is calling on the infirm and housebound, usually on the Sunday afternoon, and what a warm welcome is always extended to the Bishop, full of pleasure that he has come to see them. This was indeed true of the Sacred Heart of Jesus parish. I am always deeply touched by the level of faith which shines through bodily infirmity, and leave humbled by such encounters. 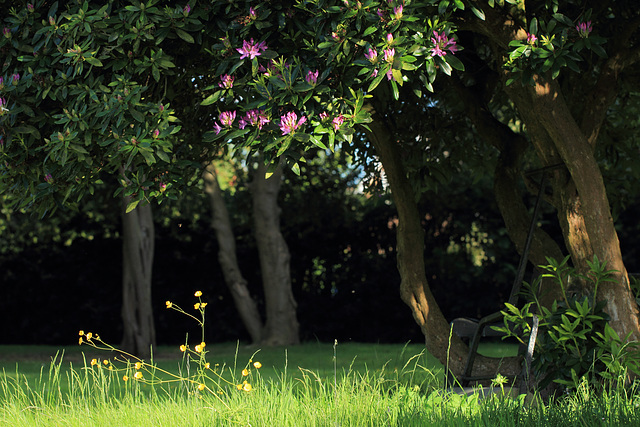 It is also reassuring to know that the elderly and housebound remain and are very much looked upon as an essential part of the parish and, although now less active physically, play their own often silent but indispensable part in the life and witness of the Church. 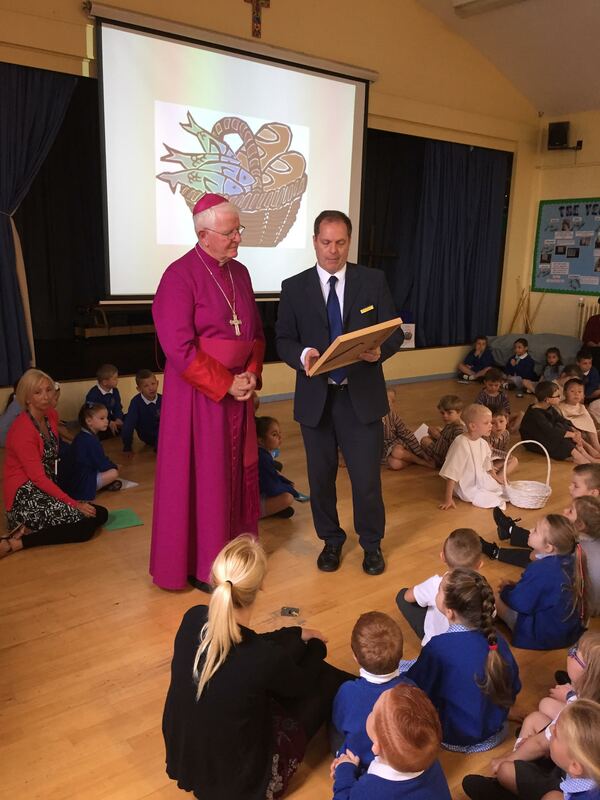 The staff and pupils of St. Margaret Mary’s Catholic Primary School made my visit there special on Monday morning by asking me to perform two blessings. 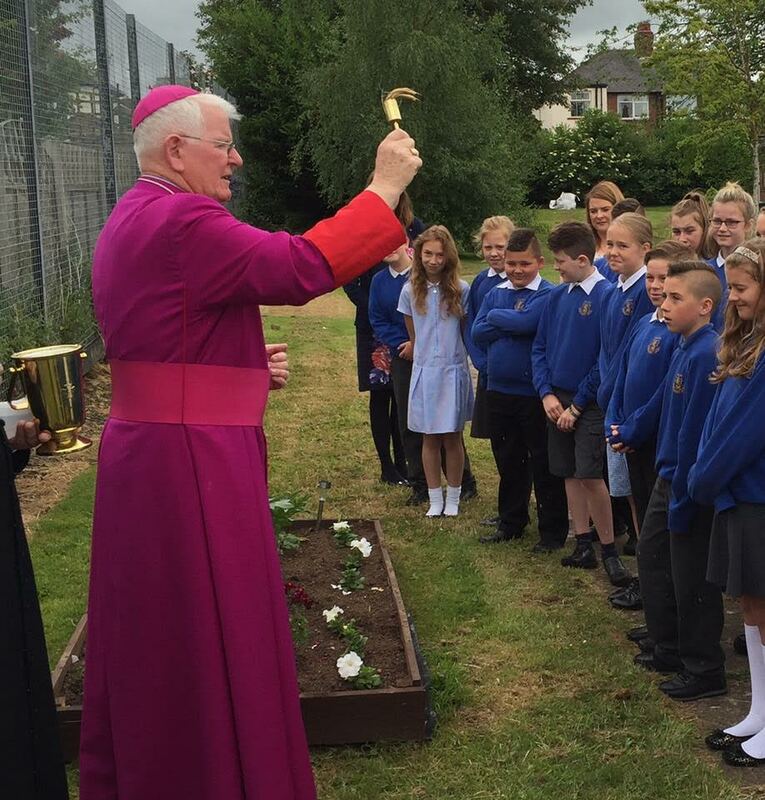 The first was the blessing of the nursery extension which was opened two years ago. The presence of the little ones during the blessing brought home to me the care and devotion given in our Catholic schools to small children just placing their first steps on the long educational ladder, and what an important contribution in human terms is represented by introducing the new generation to the wonder of learning. 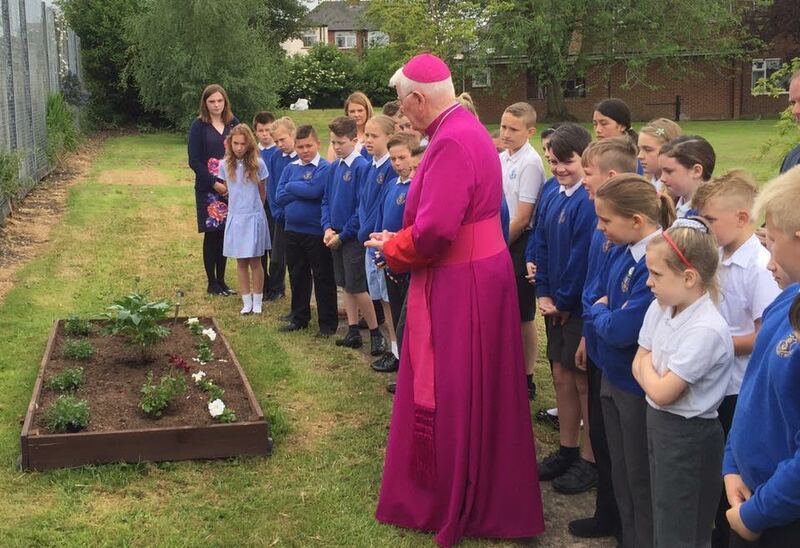 The second blessing was that of a memorial garden in the school grounds dedicated to a Fr Peter Firth, a priest of St. Margaret Mary’s parish, who died on the Normandy beaches on D Day, in the service of his country as a military chaplain. 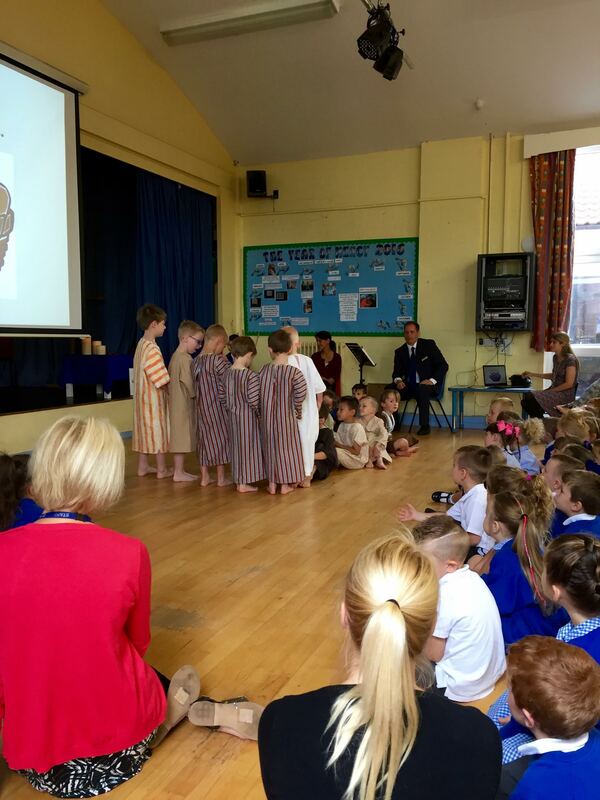 The senior class with the Head and Deputy Head gathered around me for what was a simple but moving ceremony. Fr Firth’s photograph is there for all to see, and both it and the memorial garden will serve as a reminder to generations of pupils of the sacrifices made by those gone before us in defence of their country. 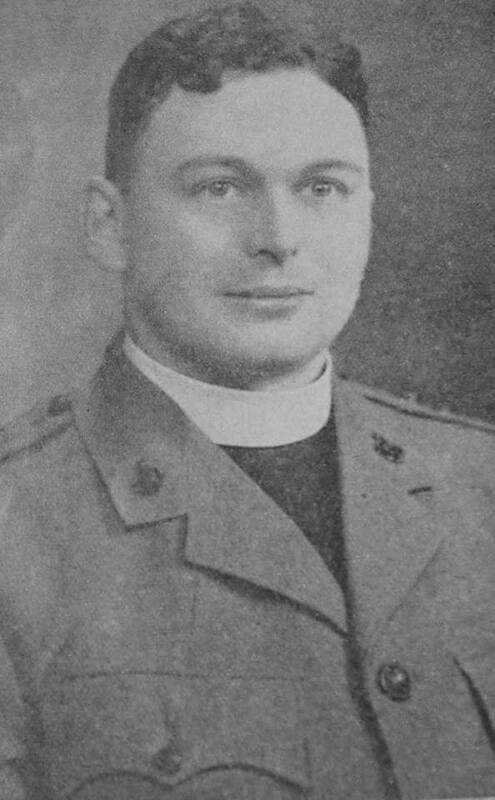 Perhaps it might even stir up a sense of vocation in some of the boys in the light of the noble and sacrificial priestly example set by Fr Firth and others like him. At the conclusion of the school assembly I was presented with a rather lovely framed poem composed by one of the Year 6 pupils. 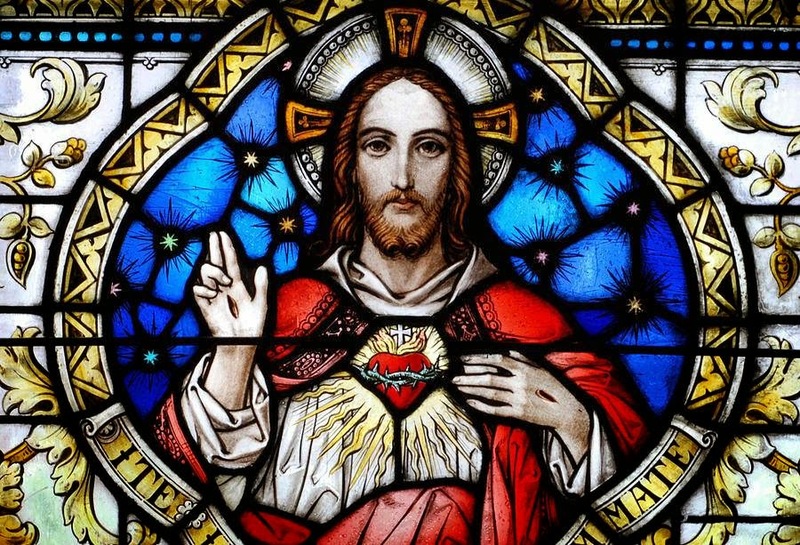 The poem in question spoke of the love of the Sacred Heart of Jesus, a love which is evergreen and is never exhausted. What a touching memento of a pleasing visit to St. Margaret Mary’s School and to the thriving parish of the Sacred Heart of Jesus! To be a Pilgrim – to Lourdes & Ladyewell! The summer months now upon us will see many Catholics travelling on pilgrimage to the various Marian shrines, both here in England and further afield. The Catholic press carry features and advertisements for pilgrimages on a weekly basis, as well as featuring less well-known places and shrines. The range on offer is quite remarkable. Central to most dioceses in Britain is an annual pilgrimage to Lourdes, one of the great Marian shrines in the Catholic world. 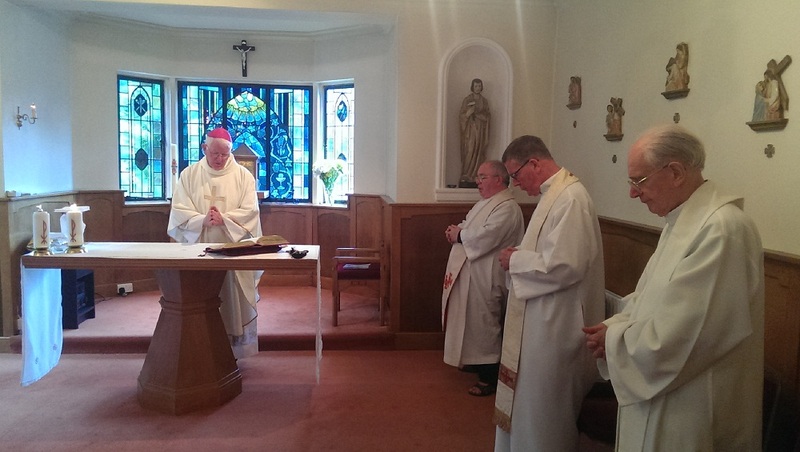 The Diocese of Lancaster is honoured to have as its principal patron, Our Lady of Lourdes, and our annual pilgrimage to Lourdes has remained popular and well-patronised over the years. The dates for this year’s Diocesan Pilgrimage are 22nd – 29th July, and there are still vacant places! No pilgrim ever regrets going to Lourdes, and invariably returns touched by the experience of having been with others who are like-minded in their attachment to Our Lady, St. Bernadette and the story of Lourdes. It is never too late to travel to Lourdes on pilgrimage, whatever a person’s age. I have met those Lourdes who just didn’t have the opportunity when they were younger, or who for some reason or another never succeeded in making the pilgrimage. They are delighted to have finally got there. Then there are others, hardly out of their teenage years, who have been on pilgrimage to Lourdes several times already in their short lives. They acknowledge that something (or someone!) keep drawing them back year after year. So, those of you who read this and have never been to Lourdes, remember that it is never too late to book on this year’s Lancaster diocesan pilgrimage. You won’t regret it! 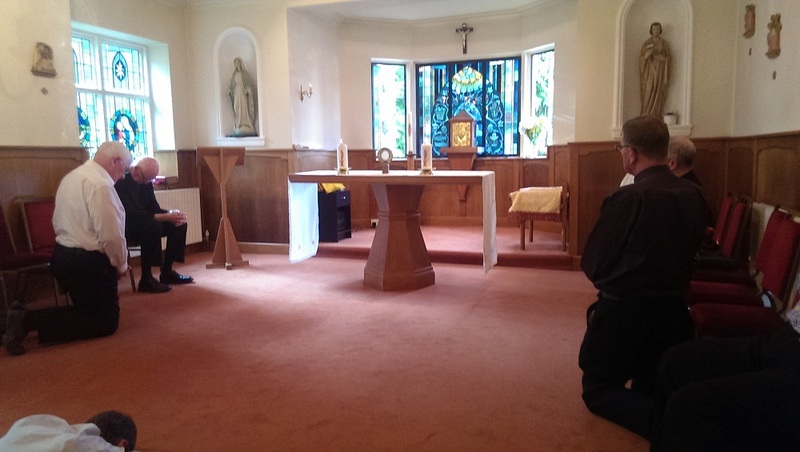 Another important moment of pilgrimage for us in Lancaster during this Jubilee Year of Mercy, and closer to home, is that to Ladyewell, near to Preston, on 2nd July, beginning with Mass at 11.00am in St. Mary’s parish church, Fernyhalgh. Ladyewell shrine does indeed deserve to be described as ancient, a place of pilgrimage whose origin goes back many centuries. In its own perhaps understated way, Ladyewell attracts visitors and pilgrims the year round. Our Lady is naturally at its centre, but it is very much associated with the Lancashire martyrs whose names adorning the shrine sanctuary. The martyrs continue to inspire and intercede for us. The walk from the parish church to the shrine at Ladyewell takes a gentle half-hour at most, along an appealing country lane, surrounded by farmland. Again, anyone reading this blog will be most welcome to join us on 2nd July. Many graces and favours will undoubtedly be on offer – Our Blessed Lady will not allow any individual pilgrim to leave empty-handed, and above all will draw us closer to her Son, our Redeemer. Pope Francis encourages us to make a pilgrimage, be it great or small, during this Year of Mercy. Whatever form our personal pilgrimage takes, may we be brought to know the Father’s love and forgiveness, and through Mary’s prayers, the sense of a new beginning in our journey of faith. The recently merged parish of the Sacred Heart of Jesus, Carlisle, celebrated its titular feast of the Sacred Heart yesterday evening in St. Margaret Mary’s church in grand liturgical style with a solemn Mass, the proper parts of which were sung to the music of the composer Rheinberger. The Mass, at which I was the celebrant, given the musical setting, went on somewhat longer than our congregations are accustomed to nowadays, but the uplifting music sung by a fine choir allowed time for quiet prayer reflection on the feast itself, and the wonderfully consoling thought of the heart of Jesus embracing each one of us in a love which transcends words. 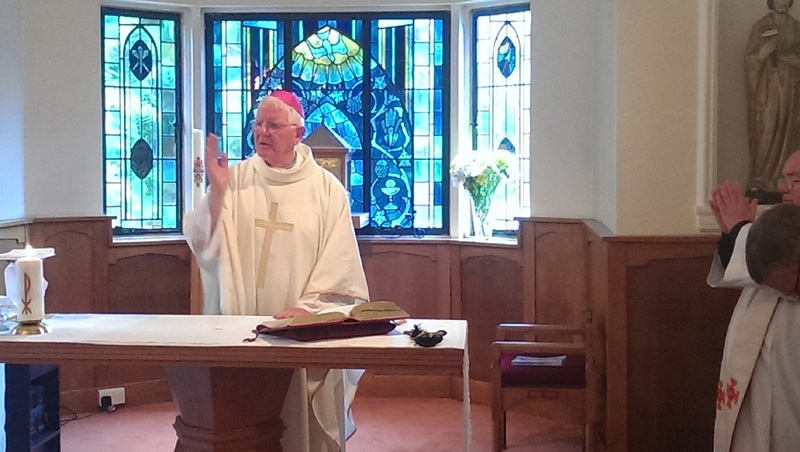 The fine homily, suitable for the occasion, also provided us with much to think about. The pleasing comments of the congregation afterwards to me suggest that devotion to the Sacred Heart still strikes a deep chord with Catholics, especially with an older generation who recall the devotion with affection from their younger days. The Jubilee Year of Mercy which the Church is currently celebrating and devotion to the Sacred Heart may be described as two sides of the one coin. Christ, Pope Francis, often repeats, is the human face of the divine mercy, and the pierced heart of Jesus reveals the extent to which Christ went to prove God’s love and mercy to the human race. The elevated and devotional nature of yesterday’s celebration of the Mass of the Sacred Heart brought home to me how a well-prepared and executed liturgy can usher us into another sphere, that of grace and the animating presence of the Spirit. The unity and togetherness that the liturgy creates out of a diverse body of believers, and something so easily overlooked, is a wonderful gift from God and a clear manifestation of the power of the Holy Spirit. The music of composers such as Rheinberger, sung at last evening’s Mass, is an example of the superb treasury of sacred music the Church possesses, especially in the plainchant tradition and the great classical composers. Such music and compositions, used on the appropriate occasions, try to capture and reflect the beauty and grandeur of God. They can assist us in our duty as human beings to reverence and worship the divine majesty of Father, Son and Holy Spirit. 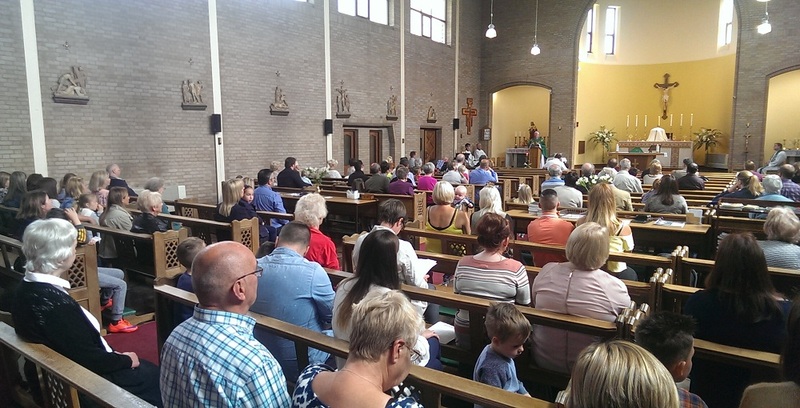 The ample refreshments on offer afterwards allowed the priest and parishioners of the Sacred Heart of Jesus to mingle and continue in another way the wonderfully uplifting Mass of celebration for their titular feast – and solemnity – in St. Margaret Mary’s church.